I love all the lead process maps salesforce.com releases – they are visually appealing splashes of eye candy that give newbies a good idea of how data could flow through the system. If you haven’t seen these before you can find them here, here and here. 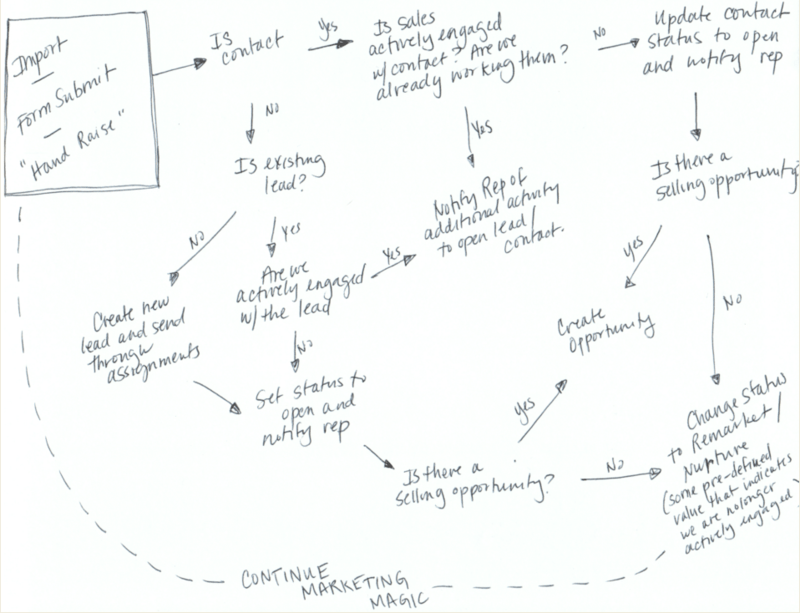 The main problem with these lead process flow maps is really within the first step of “create a new lead” because, in practice, this isn’t how it usually works. Duplicate records cripple the sales organization’s ability to see the true history of an individual and cloud their ability to accurately track and measure outcomes, which is why they dedupe before creating a new lead. However, once companies start to dedupe, many of them lose sight of their contact database and are not able to communicate to sales when a follow up needs to occur or track the outcome. Up to this point, many of the processes and metrics marketers have employed have been almost entirely lead-centric. The good news is, you can easily track engagement with your contact database and it’s not as hard as it may seem. Love it! A few years ago when I started deduping and talking about bypassing the Lead object if you can append to an existing Contact… People thought I was speaking blasphemy! It is interesting to see the evolution of the ecosystem over the past few years! It is also worth noting that your first couple steps there for “Is Contact?” and “Is Existing Lead?” can be done automatically with tools like Ringlead and CRMfusion… If you leave those decisions up to a Rep, the likelihood is that they won’t manually dedupe to append to the existing records. Which tools you use depend on several factors like which MA system you use (e.g. Marketo vs. Eloqua vs. Pardot, etc), other integrations pumping data into your org (like AppExchange, Data.com, etc), manual input of new Leads via the UI, etc.